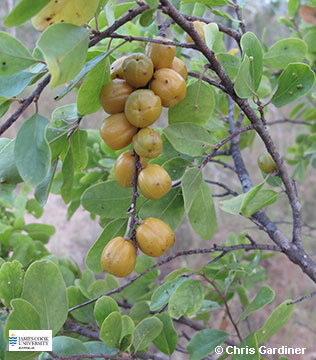 This shrub has alternate, simple, broadly elliptical leaves 2-5 cm long, glossy green above but densely covered in dull yellowish hairs both long and short ones. Male flowers in axillary clusters, female solitary. Fruit is a 3-4 valved capsule with 6-8 grooves, tardily dehiscent, often explosively, orange when mature, pubescent. Insect galls are often present on the leaves.